Peanuts are one of the most important crops in Southern states like Missouri, according to Iowa State University. Instead of buying peanuts in the store, grow your own peanut harvest in your backyard. You can start planting peanuts as soon as the soil temperature reaches 65 degrees F. The University of Missouri suggests planting peanuts at the end of April in southern Missouri; early May in central Missouri; and mid-May in northern Missouri. Select and prepare a gardening site for your peanuts. The plants grow best in full sun and well-draining soil. Use a spade to breakup the dirt to a depth of 8 to 12 inches, as peanuts require loose loam for their underground pods. Mix in 3 to 4 inches of compost to improve drainage and encourage a loose soil texture. Amend the garden site, spreading a basic all-purpose fertilizer like a 10-10-10 or 8-8-8 (nitrogen-phosphorus-potassium) product. Apply the fertilizer at the rate listed on its label, since potency varies widely by product. Follow with an application of gypsum at a rate of 1 cup for every 10 feet of gardening row. 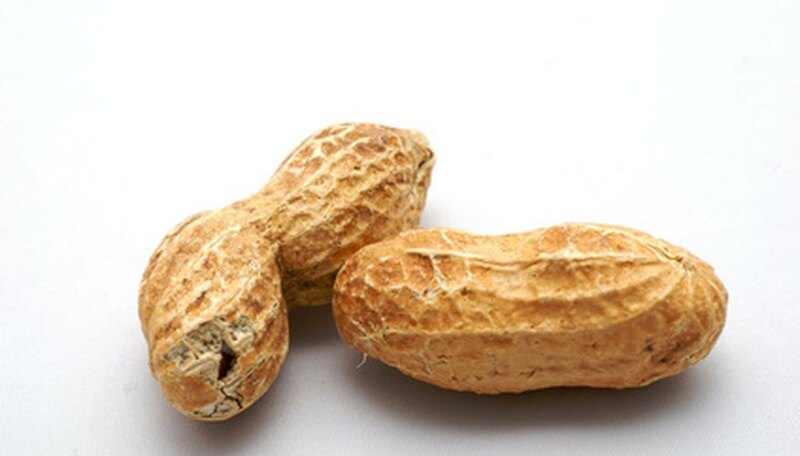 This improves the soil's calcium concentration, which enhances proper peanut growth. Plant the peanut seeds. The University of Missouri Extension recommends burying each seed 1 inch below the soil surface. If you're growing more than one row of peanuts, space each row apart by 30 inches. Water the planting site twice daily or as necessary to keep the soil moist. The peanuts will typically germinate within two weeks. After germination, reduce irrigation to two weekly watering sessions. When watering, use enough water to moisten the soil to a depth of 8 to 12 inches. Harvest the peanuts as soon as the plants' leaves begins to turn yellow at the end of summer. Push a pitchfork into the soil below the plant and lift upwards to reveal the plant's underground nuts. In Missouri, peanuts are generally ready for harvesting within 135 days of sowing, according to the University of Missouri Extension. For general snacking and eating, the University of Missouri recommends planting 10 peanut plants per person.